Ping is the favorite tool of network administrators for testing connectivity and response time over networks, but is there a limit to how fast response times can get? Of course there is. The answer is c.
Ultimately response time over a network is limited by the speed of light. In a vacuum, light travels with a speed of 299,792 km/s. In air, pretty close to that. It gets slower when traveling through glass (think fiber optics) but this isn’t a Physics paper so we will settle for the theoretical maximum for now. Electricity travels with close to the speed of light as well. So, if we assume that a “ping” travels with the speed of light, which are the best possible response times we can get? The distance between New York and Paris is 5,839 km. For light to travel from New York to Paris and then back again would take 40 milliseconds. If you choose the shortest route, the maximum distance between two locations will never be more than halfway around the planet. Halfway around Earth is about 20,000 km. 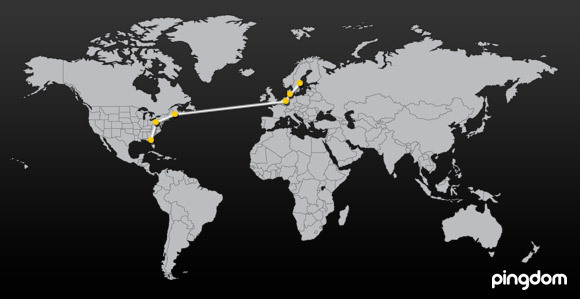 Considering that Ping goes to a destination and then back again, the packet sent by Ping would travel 40,000 km, the equivalent of a trip around Earth. Anyone who has tried to ping various servers across the world will know that this is a way better response time than what you can realistically get. So why is ping so slow? The examples above take place under ideal conditions that don’t exist in the real world. The actual distance traveled will be longer, more like zig zag than a straight line. Repeaters, switches and routers will slow down transfer speeds. The more equipment the signal has to pass through (for example routers), the longer it will take to reach its target. The actual speed of the signal will never quite match the speed of light. Even with fiber optics (glass) the speed of light is about 30% slower than through vacuum or air, and most of the distance covered will be through fiber. A beam of light bounces around like a pinball when it travels along the thin (admittedly extremely thin) fiber, and that will of course make the distance traveled even longer. With all this in mind, you should probably double the “ideal” response times shown above for a more realistic target to aim at. It’s useful to know when there is room to push for better network performance, and when the actual physical limits set in. In a Vacuum yes, in an Optical Fibre, Light travels 31 % slower. to look on the bright side, at least we dont attach bits on top of snals and send them around that way.